I recently purchased a new truck so my son and I decided to take it on a fishing trip for the first time. It was in the wee hours of the morning when we left the house, and it was especially dark on this eerie moonless morning. We had traveled less than a mile from the house, when a large Doe came charging out of the ditch in front of us. I slammed on the brakes with the trailer in tow, and just before we came to a complete stop, the deer passed just inches from our front bumper. As I took my foot off the brake, and before I could complete the words, “That was a close one”, a much larger Buck came out of the ditch chasing the first deer, and preceded to slam into the front of my Suburban. No car-deer collision is good, but as I lowered my eyes down to the dash board, I could barely see the odometer as it was slightly blurred from the tears that I was fighting back. After all, I had to be the strong fatherly figure in front of my son didn’t I? I couldn’t let him see me cry. 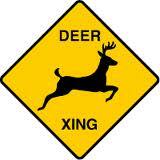 Yes, I was concerned for the deer, but in addition, my truck had only 150 Miles on it. Regardless if the tear was for the deer or the truck, the truck had sustained nearly $5000 in damage, and we were lucky that we didn’t get hurt. Minnesota ranks eighth nationwide in car-deer collisions and the only state in the top ten who has seen a rise in the number of collisions this past year. Within the coming weeks, thousands of Minnesota deer hunters will be traveling to their favorite hunting land in search of that trophy Buck. The Minnesota Highway patrol recommends you stay the course to avoid going into the ditch where a more serious accident may occur. Even if you do everything right, you can still end up needing a collision repair or windshield replacement as a result of a car-deer collision. Even State Troopers are not immune to this type of collision as many are recorded on their dashboard cameras each year. As you head out of town to visit your favorite hunting grounds, please heed this advice and you, the deer and your vehicle will be much better off because of it. My mom has always accused me of needing to learn things the hard way…I guess she’s right.